I love sprinkling black pepper on my salads, especially if I think they’re too bland (even for me). So I got really curious as to what this spice actually contributes to our health and I wanted to share it with you black pepper lovers out there. It’s not bad, isn’t it? Though I know you and I won’t actually consume 28g of pepper in one day, were getting a percentage of these numbers even if it’s just a teaspoon of pepper. A property of black pepper it that it is a carminative, which means there will be minimal or no intestinal gas formation. It can also warm the body, hence promoting sweating and toxin release. If you consume beta-carotene, B-vitamins, and selenium, pepper enhances the absorption of these. 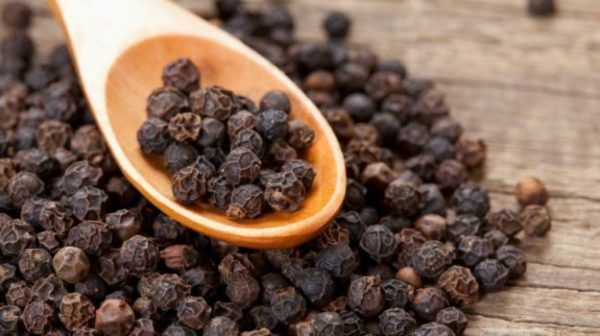 Black pepper is anti-inflammatory, antioxidant, and antibacterial. What more can you ask for? If you still can’t wrap your head around these really great health benefits, watch this video and learn more about it! Black pepper actually makes food taste twice as better. At first I was just annoyed how it makes meals spicy, but that was just me failing to realize that I love it’s unique flavor. The health benefits probably aren’t that much, since I don’t think I’m consuming 28g. I prepare for the entire family so I don’t think all that 28g goes inside my body. However, since it’s an added boost, it’s an amazing benefit. Is there a difference between ground pepper and the very small ones in grocery stores? Let’s just say that when it’s you who ground the pepper, you’re 100% sure that it’s pure. While the pre-packed in grocery stores “might” not be. Well, we put pepper in almost anything. So I guess it’s safe to say that there’s really no way for us to be deficient in anything. I can’t believe that black peppers are this great. I thought it was just one of those spices that taste good but don’t offer much benefits.? Now there’s a reason for me to add pepper to almost everything. My potato salad isn’t complete without a dash of black pepper. I’m just glad that these black things not only taste good but are also healthy. Pepper is amazing. It has a lot of nutrients even though it’s such a small thing! Never underestimate the small black pepper. No matter how healthy black pepper is, don’t go overboard. ?